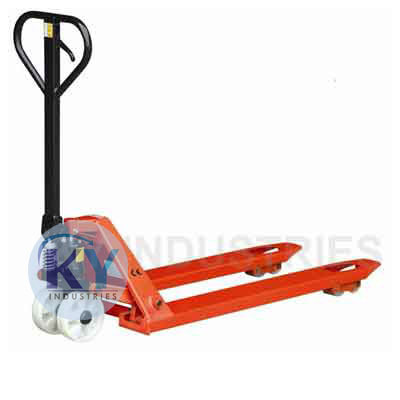 We offer our clients a vast assortment of Pallet Truck that has high load bearing capacity and is provided with Polyurethane / UHMW-PE tandem rollers for quieter and smoother rolling over rough surfaces. It is also equipped with a one-piece "C" section forks for greater strength and a sully strengthened chassis along inside of forks. The pallet truck also has bushed metal to metal parts that do not require any greasing and it also has a control lever with three-positions of up, neutral and down. Available standard capacity: 2500 Kgs., Fork Length 1150,Width 535. Available capacity options: 2000 Kgs, 2500 Kgs, 3000 Kgs, 5000 Kgs. Available options: manual, weight scale, battery operator. 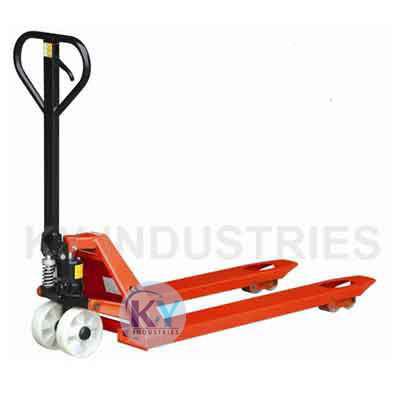 Choice: Special fork length, width, wheels & capacity as per requirement.